Bhupinder Singh Hooda has twice served as the chief minister of Haryana. 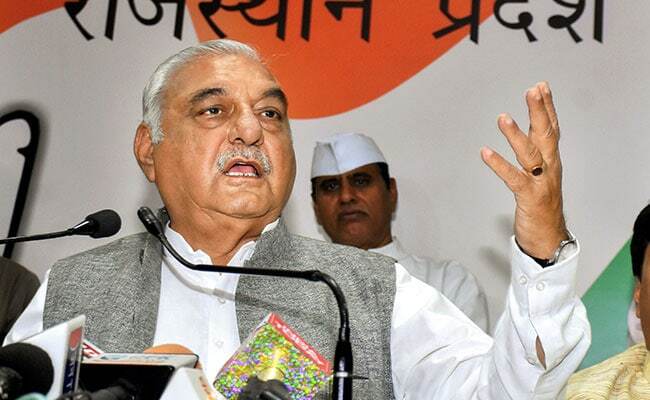 After the Congress governments in three states -- Rajasthan, Madhya Pradesh and Chhattisgarh -- waived farm loans worth thousands of crores within hours of coming to power, senior party leader Bhupinder Singh Hooda, too, made a promise that farmers would be benefitted within hours of Congress coming to power in the state. Haryana votes for the new government next year. Mr Hooda, who has twice served as the chief minister of Haryana, said, "The Congress would waive farm loans within six hours of forming government in Haryana." The old-age pension in Haryana will be increased from Rs 2,000 to Rs 3,000 and the electricity bills will be reduced by 50 per cent within 12 hours, he added. The Congress' farm loan waivers have inspired the ruling party as well as two BJP-ruled states announced reprieve for farmers within 24 hours of farm loan waivers in Madhya Pradesh and Chhattisgarh. While loans of nearly 8 lakh farmers were waived in Assam -- an exercise expected to cost Rs 600 crore, soon after, the Gujarat government also said it would forgo rural electricity bills to the tune of Rs 650 crore -- a measure that provide huge relief to the state's farmers. The centre is also planning a major announcement for farmers. According to finance ministry sources, the government will announce a new set of measures for farmers before the end of the winter session on January 5. The pro-farmers measures are crucial for the government especially after the BJP's loss in Madhya Pradesh, Rajasthan and Chhattisgarh to the Congress was attributed to farmers' anger among other factors. After waivers in these states, Congress chief Rahul Gandhi told the media that they would "not let Prime Minister Narendra Modi sleep or rest" until an all-India loan waiver scheme was announced. However, in Karnataka, where the Congress formed the government in alliance with the Janata Dal Secular and promised relief for farmers, it took months for the first loan waivers to actually happen. The coalition government said the scheme will cover around 44 lakh farmers at a cost of Rs 48,000 crore. But only 800 farmers have received the waiver till now.